Home / Readers Forum / Biodegradable Shoes, The Future? Who remembers all of your family’s shoes piling up at the shoe rack? No one ever wanted to throw away their old stinky shoes. Now that thought process can be thrown away with the new biodegradable shoe! Adidas has now produced something that few in the shoe industry could have never thought would be possible. A biodegradable shoe. Adidas calls the newfound product a future craft biofabric which allows the shoe to be dissolved within 36 hours. All you have to do is add a special enzyme to the shoe and it dissolves away. The shoes are made with a material called biosteel which are 15% percent lighter than traditional shoes. The new shoes are planned to come out on the market in 2018 and could help give adidas an edge in future sales. Adidas has been searching for the next best thing to send them to the top over companies like Under Armour and Nike and this could be it. 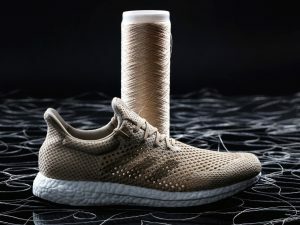 Most shoes will end up sitting in a landfill for the rest of time, barley ever degrading into the earth but this shoe gives hope for the future of the environment. Adidas is making a huge move by taking ownership in their global footprint every way they can and this gives them a major plus to the consumer. By helping attack the environmental issue of waste management adidas is putting the burden on themselves. I would not be surprised to see the price of these specific shoes to cost more but eventually it will pay off producing less waste in the long run. For the future, this could be what the shoe industry will turn into. My question to the industry would be when will other top competitors to adidas (such as Nike and Under Armour) jump on this idea and even make it better?